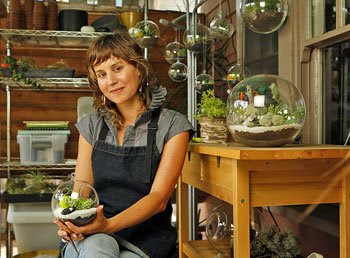 Check out Britton Neubacher's "Eco Orb" terrariums, based in San Diego. I love the idea of using spherical globes and she also dabbles in living interior design. Comfortable or not, Neubacher's business, Tend Living, is embraced in the local design community. And along with making glass orbs, she does plant-scaping for private homes and businesses. She's also teamed up with Pigment, a North Park boutique, to make living walls. Think of a giant portrait made out of plants, or a vertical flower bed, and you get the idea. The pieces are dramatic and stylish. There's one on display at the San Diego County Fair that has its own irrigation system. But she does make smaller versions that, at $295 a panel, can be added on over time. While presenting plants artfully is why Neubacher's become a design star, her main goal is to instill a love of nature into popular culture. Amazing! How do people get all these ideas?! Hi Leigh, love your new banner by the way! Sorry Lauren.. was thinking about someone else when I wrote Hi Leigh!! Duh! Is friday and I'm all marshmallow brain today!